This past weekend hundreds of DC’s food-obsessed got a chance to preview eight upcoming restaurants all in one fell swoop. Like teenagers at a rock concert, food fans could barely contain their enthusiasm for NKOTB, which is short for “New Kitchens on the Block” and not a boy band. 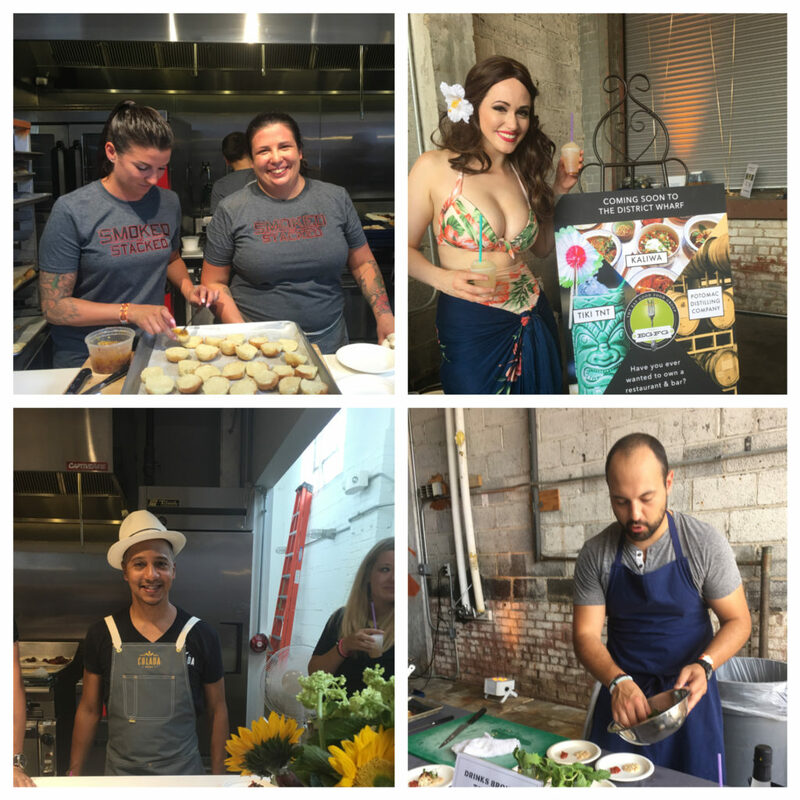 The pop-up event was produced by local culinary incubator Mess Hall. NKOTB featured at least one restaurant set to debut in the fall, others that won’t open permanent doors until well into 2017, and some that are currently in the pop-up only phase. Regardless of opening dates, these chefs were here to perform, and their efforts deserve a standing ovation. Here are some highlights. Chef Matt Baker (formerly of City Perch and Occidental) served brioche-crusted Maryland blue crab with sweet corn pudding, herb salad, and pickled jalapeños. He is slated to open Gravitas in Ivy City later this year. The fine-dining restaurant will showcase locally sourced ingredients, with a special emphasis on vegetables. Bring on the vegetarian tasting menu! As he works towards the Gravitas opening, Baker keeps busy with pop-ups around town. Smoked & Stacked, from Chef Marjorie Meek-Bradley (Ripple, Roofer’s Union) will open in the DC Convention Center in Shaw in September. House-made smoked pastrami, chicken, and portobello mushroom sandwiches will be among the featured items. 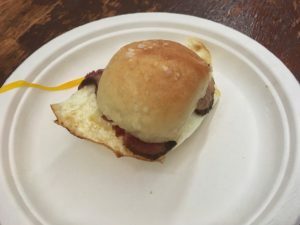 A DC “Top Chef” favorite, Meek-Bradley had a long line of admirers waiting to preview her New Yorker breakfast sandwich with pastrami, fried egg, and hot pepper jelly. I was dismayed when Chef/restaurateur Jeff Black closed Addie’s on Rockville Pike in 2013. I’m delighted that the restaurant will reopen in Park Potomac, Maryland, most likely in spring 2017. I confess that I returned multiple times to the Addie’s table for the addictive nachos piled high with Maryland blue crab salad, curried sweet corn, and cherry tomatoes. Another crowd favorite at NKOTB was Colada Shop, the upcoming Cuban cafe from Juan Coronado (formerly of Minibar) and Daniella Senior. The cafe will offer croquetas, empanadas, coffee, and cocktails in both Sterling, Virginia and at 1405 T Street, NW. Coronado came on strong (really strong) with a peanut butter negroni, a perfect prelude to tasty guava and queso pastelitos. Chef Cathal Armstrong and Todd Thrasher of Restaurant Eve in Alexandria are familiar names to many DC area restaurant-goers. They stirred up interest in their upcoming projects with Filipino style chicken wings and boozy snow cones. They’ll open Kaliwa featuring a combination of Filipino, Thai, and Korean menus as well as Potomac Distilling Company, and a tiki bar called Tiki T.N.T. on the District Wharf in spring 2017. Very exciting news from this dynamic duo! Chef Yuan Tang of the upcoming Rooster & Owl honed his skills in New York at Jean George, The Modern, and Dovetail. He’s still in search of a permanent spot to feature his contemporary American food with Asian accents. 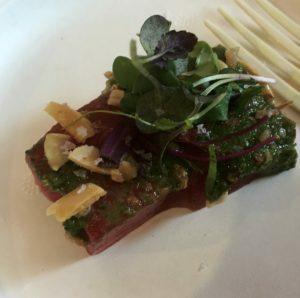 His NKOTB tastes were watermelon with green curry, almonds, and crispy shallots as well as a heaping plate of pork fried rice with soft scrambled eggs and Chinese sausage. Keep your eyes open for future pop-ups. Chef Stefano Frigerio, formerly of Fiola, is currently hosting dinners at George’s Mill Artisan Cheese Farm. He plans to open Shadowlawn with partners Jason Miller and Michael Mercer (Wine Kitchen Restaurants) in Loudoun County. The farm to table concept is literally about taking the restaurant to a farm. Frigerio offered up crispy pig ears with sarsaparilla glaze, pickled and fried onions, and char-smoked mayo. He also served the lone dessert at the event- a wonderfully fresh goat cheese ice cream with pickled blueberry leather and raw honey. Al Goldberg of Mess Hall tells me that he and event co-producer Nevin Martell are planning additional NKOTB events – perhaps quarterly. Stay tuned. You won’t want to miss out on the next crop of DC pop stars.